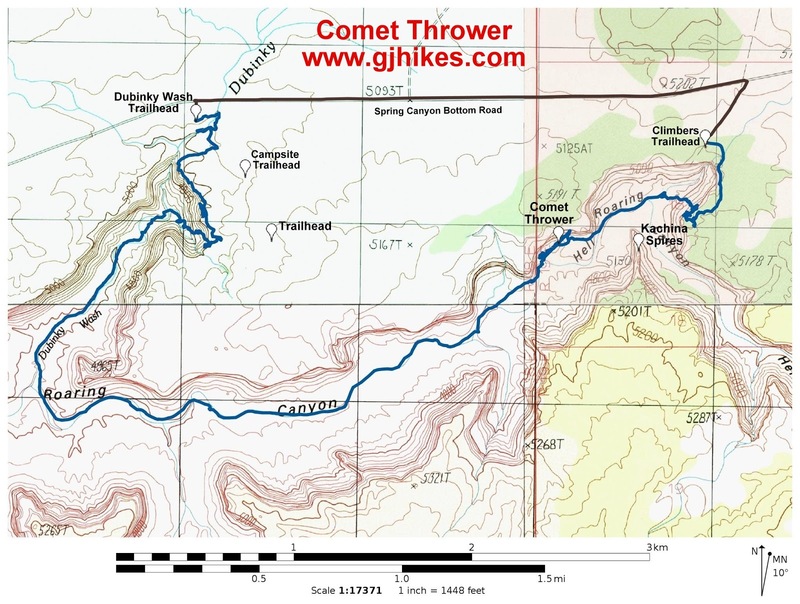 The Comet Thrower is a pictograph site that is located in Hell Roaring Canyon near Moab, Utah. The panel of pictographs is on a south facing cliff across the canyon from a rock formation known as the Kachina Spires. 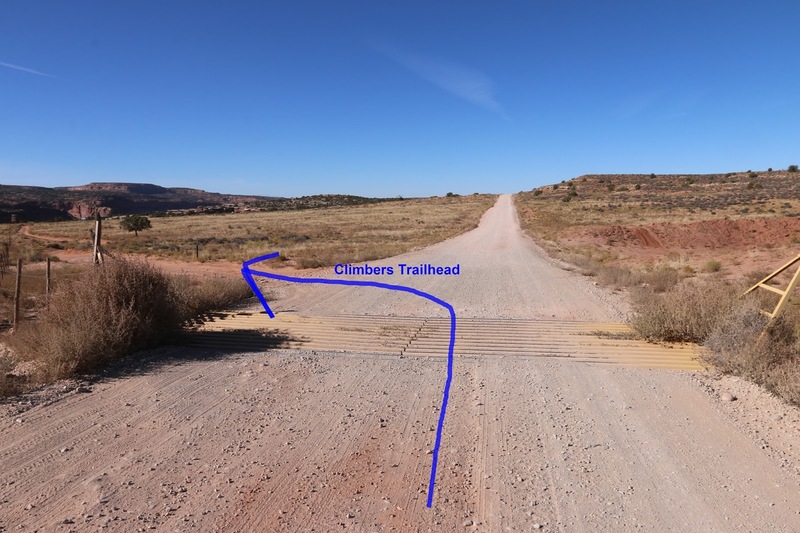 Access into the canyon can be made by descending an old cattle trail into Dubinky Wash and then hiking up Hell Roaring Canyon or by descending a Class III+ climbers access trail that is across from the Kachina Spires. 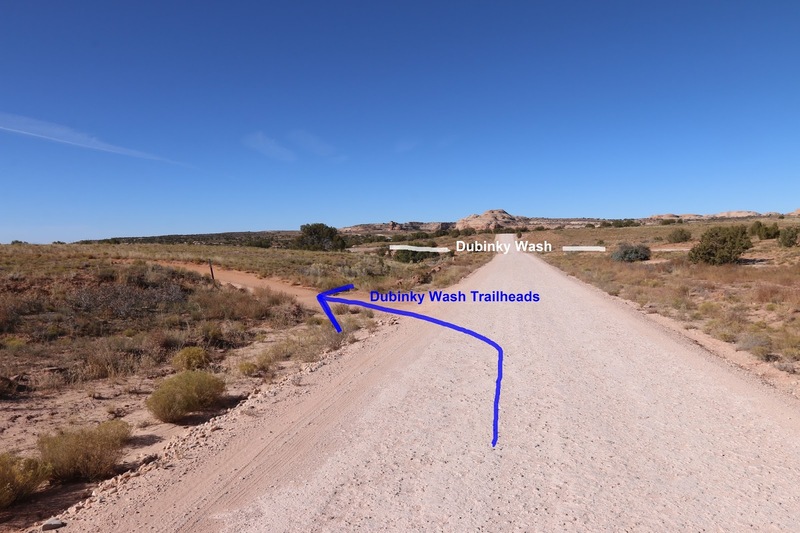 The route through Dubinky Wash is about 5 miles one-way while the route via the climbers trail is only 1.4 miles one-way. For this post we wanted to check out both routes so we left our mountain bikes at the Kachina Spires end of the canyon and began hiking at Dubinky Wash. The total round trip distance ended up being about 8.5 miles with 2 of that being an easy bike ride along the road. To get to the first trailhead where we dropped off our bikes travel north out of Moab on Highway 191 to the Highway 313 turnoff that is marked by signs for Dead Horse Point State Park and Canyonlands National Park. Follow Highway 313 for about 8.5 miles and turn right onto the Dubinky Well Road. The road isn't marked other than with a sign for the Lone Mesa Campground. There is a restroom at a view area on the opposite side of the road just before the turnoff. Follow the graveled Dubinky Well Road for about 1.5 miles to an intersection where the Dubinky Well Road branches off on the right and the road straight ahead becomes the Hey Joe Canyon Safari Route, a.k.a the Spring Canyon Road. Call it whatever you want because there are no signs. Continue for another 2.4 miles and turn left after crossing a cattle guard onto a dirt track that leads to some primitive campsites after a hundred yards or so near the rim of the canyon. From what we are calling the Climbers Access trailhead you can scramble down to the edge of the canyon and get a good look at the route into the canyon and the Kachina Spires. The Comet Thrower panel is just around the edge of a cliff across the canyon from the spires. This is the shortest route into and out of Hell Roaring Canyon. The second trailhead is 2 miles further down the road where it is crossed by Dubinky Wash. The best starting point is down a dirt road just before crossing the wash. Drive past the first primitive campsite to the next one and begin from there. There are a couple of other spots where you could park but they are harder to describe. Feel free to search then out on your own. 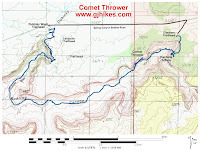 At the time we hiked the Comet Thrower for this post there weren't any good detailed directions on getting to the site. None that were freely available that is. We ended up exploring the rim of the canyon looking for the old cow trail that descends a makeshift route down a stretch of slickrock. The GPS coordinates for the drop in point are N 38 37.681 W 109 53.759. The route into the canyon begins in the slickrock bowl of a spillover. It is pretty easy to get down as it starts out. To get down the slickrock shoulder the cowboys ran iron stakes into the rock, wired logs to them, and then built a path out of rocks and dirt. Some of the material has fallen away but there is still enough left to make use of. There is one span where an old rotten log looks like it wouldn't take much to snap it in two but we were able to slide by it without putting any weight on it. The rest of the route into the canyon is down a talus slope where there isn't much of interest to point out other than there are a few cairns that make route finding easier. 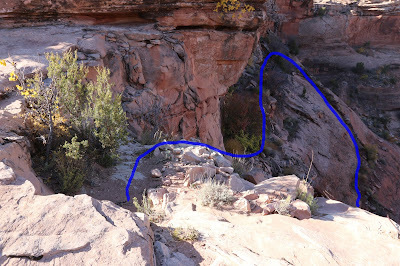 Once the route gets all the way down into Dubinky Wash it is only a matter of following it out to where it runs into the main branch of Hell Roaring Canyon. At that point the route goes to the left and turns up the canyon. There is an old double track that is pretty easy to hike along in places. At times it follows the wash where it pretty much disappears before showing up again later on. Don't follow any trails that lead away from the main wash toward one of the side canyons or elsewhere. 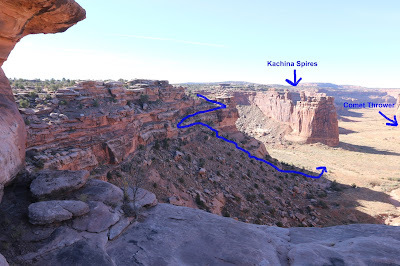 Eventually the route will travel around enough bends that off in the distance the Kachina Spires will come into view. The spires are a good reference point for finding the Comet Thrower and the route out of the canyon. They are also quite spectacular to look at and good for lifting your spirits with the thought that the destination is indeed getting closer. The wash actually has a pretty solid bottom that is mostly nice for hiking. The ground doesn't get real sandy until you get out of the wash. 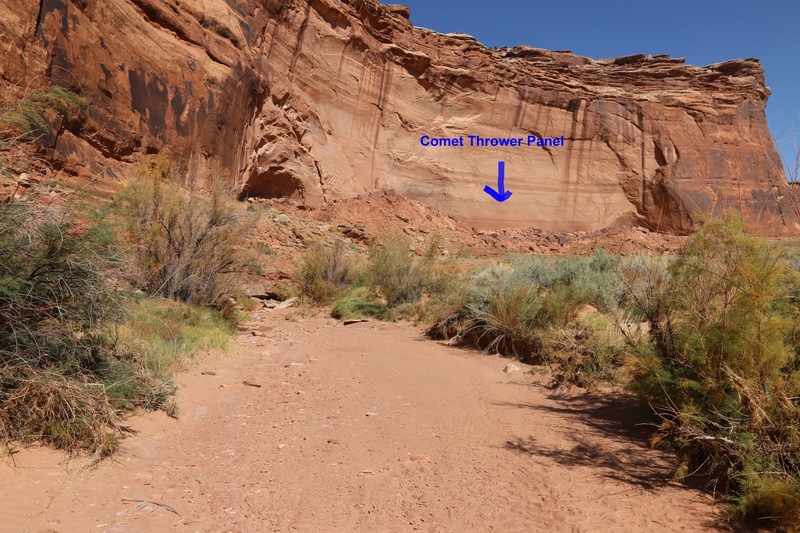 The Comet Thrower panel is located in the middle of a cliff and is easy to spot from the wash once you get close enough. If you zoom in on the picture of the Comet Thrower you can see that it is surrounded by yellow as though it is enveloped in fire. The image that looks like a comet seems to have the tail facing the wrong direction if it is being thrown. The picture looks more like that of a comet catcher. Or could it be saying that the figure surrounded by yellow arrived on the fiery object that is being referred to as a comet. Much of the detail has faded but more can be seen by zooming in on the photo. like a couple of white Fremont type images. Between the Comet Thrower and the alcove to the west is a very large elk. When you look closely at it you can see that it has something in its belly as well as a calf near its head. Further down the cliff to the alcove itself there are several more pictograph images. To continue around the loop like we did for this post follow the trail toward the wash in the direction of the Kachina Spires. If you stay in the main wash you should be able to pick out the climbers access trail that is fairly well worn. We went up the side wash but then cut across until we found it. From the wash the trail follows a cairned route up a talus slope to where it begins scrambling up the cliff going from ledge to ledge. The biggest crux of the climbers route is a shelf that has a low overhang with a couple of boulders clogging up one end of it. At this point you have to get down on your belly and either push or pull your gear along as you crawl your way across. Crawling over the boulders might be easier than crawling along the ledge. As you can see from this photo there is probably at least 18" of space between the boulder and the roof. Behind Tom you can see another view of the ledge that you have to crawl along. The exposure isn't too bad along the ledge until you get to the boulders and then from there to the point where you climb up to the next level the cliff drops off abruptly for 2-3 hundred feet or so. A person probably would want to take care so they don't find out firsthand why they call this stuff slickrock. 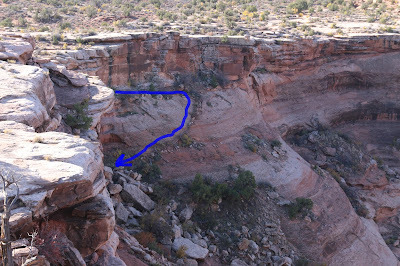 There are several more ledges to scramble up before you finally get all the way on top of the mesa. From there it is an easy hike around to the primitive camping area and where for us our bikes were waiting for us to ride the 2 miles or so down the road to where we had parked. It is about 5 miles from where we parked to get to the Comet Thrower through Dubinky Wash. If you decide that exiting on the climbers trail isn't your cup of tea then you are looking at a 10 mile round trip. Probably a little less since we spent quite a bit of messing around along the rim looking for the cow trail. Of course, if the climbers access is just the sort of thing that gets you going you can come in that way and your round trip distance would only be about 2.8 miles. We wanted to check out the cow trail and the climbers access route so we made a loop out of it. All in all we had a hell roaring good time of it. Between the pictographs, Kachina Spires and some adventuresome scrambles there is a lot to enjoy on this hike. If you would like to see it for yourself then all you have to do is 'Take a hike'.